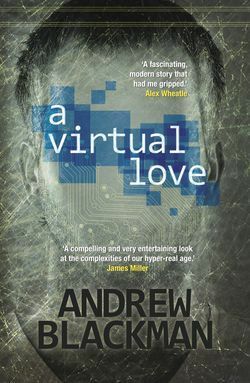 One of the books I eagerly awaited this year was Andrew Blackman’s ‘A Virtual Love’. I read his ‘On the Holloway road’ sometime back and liked it very much. So when ‘A Virtual Love’ came out this month, I couldn’t wait to get it and read it. I finished reading it in a couple of sittings during the last two days. Here is what I think. ‘A Virtual Love’ is about Jeff Brennan and his life and loves. Jeff works as an IT consultant during the day. He spends a lot of time with his friend Jon in the evenings and during weekends playing computer games. The way he spends time is not necessarily by going to Jon’s place – why does one need to do that in today’s online world – but by having video chats with him online. Sometimes Jeff also goes to protests which are organized by another of his friends Marcus, against big corporates. During one of these protests, Jeff meets a young American woman called Marie. Marie works for a home shelter which helps who live in the streets. She also takes part in protests. When Jeff and Marie get introduced to each other after a protest, Marie mistakenly thinks that Jeff is the famous blogger who blogs on political and social issues. Jeff doesn’t do anything to correct that opinion. Jeff and Marie fall in love and after a time start living together. Jeff manages to juggle his different identities and impersonations, and only a few people know about the truth. But then one day suddenly the real blogger Jeff Brennan decides to turn up at a protest. And all hell breaks loose in our hero Jeff’s life. Will Jeff survive this storm? What will happen to Jeff’s and Marie’s relationship? Can Jeff continue to juggle his real life and his online selves and impersonations and deceptions, successfully? The answers to these questions form the rest of the story. ‘A Virtual Love’ has an interesting narrative structure. Though it is about Jeff Brennan, it is told through multiple narrators who all play important parts in Jeff’s life. One of them is Jeff’s grandfather, whom Jeff visits every weekend. Marie is also one of the narrators and the other narrators include Jeff’s friend Jon, Jeff’s protestor friend Marcus and the real blogger Jeff Brennan. Our hero Jeff Brennan is not one of the narrators and we get to know about him only through what other people think about him. This narrative technique made me think of Roberto Bolano’s ‘The Savage Detectives’ in which also the main character’s life is portrayed through the eyes of his friends and acquaintances. My favourite narrator and character in the story was Jeff’s grandfather. He is the opposite of the modern, online person – he doesn’t have a mobile phone, he struggles to use the computer, he is not on Facebook, he is able to sit quietly and contemplate for a long period of time, when he wants to write something he never uses the computer but he either uses pen and paper or types it out using the typewriter. He is the kind of character who is the counterpoint to the other characters in the story and I totally fell in love with him. The book captures the social lives of the people of the 21st century quite well – how most people spend a lot of time online updating Facebook, Twitter and other social networking sites, blogging, reading and replying to comments, how people buy more and more things – books, clothes, shoes, gifts, food – online thus converting the computer into a marketplace, how friendships are built online, how online friends sometimes feel more real and authentic and intellectually sophisticated than real-world friends, how relationships are nurtured online and how breakups can happen online too. This is the kind of portrayal that a modern reader (who spends too much time online for his / her own good, if I may add – and I am the first guilty party here) will totally identify with. Jeff’s grandfather’s perspective on online life is quite interesting and provides a fascinating counterpoint to what the rest of the characters think and in some ways shows that some things don’t change. Andrew Blackman’s trademark prose is spare and beautiful and it rises to sublime heights in the chapters which the grandfather narrates (Sorry I can’t stop mentioning my favourite character again and again – his thoughts are wonderful to read). The place where the grandfather says that he likes typing on the typewriter and then putting his written work together and tying it up with a rubber band vertically and horizontally made me smile and think of my own father (my father used to write, not type. But he definitely used rubber bands.). The conclusion of the story was a little open ended and even sad for me. But it is interesting and throught-provoking in the context of the story. It makes us think and question the online identities we all have and how they might be similar or different to the identities we have in the real world. It also makes us wonder whether any of our identities are real or whether it is all an act or as some might put it, whether they are all valid identities highlighting different facets of our personalities to the world. ‘A Virtual Love’ is an interesting take on today’s world in which online identities of people sometimes submerge their offline ones. I enjoyed reading it. I can’t wait to find out what themes Andrew Blackman will explore in his next book. You can find Delia’s review of the book here. Of course, I am accustomed to mobile phones by now, but the idea of them ringing in my own house still bothers me. It diminishes my role as host. I’m used to the idea that in my own house everything is under my control. If the phone rings while I have company, I can decide whether or not to answer. Now it’s out of my hands. You bring your own world into my front room, and I am reduced to the role of a passive observer. Since it was the first Sunday of the month, I’d spent the morning cleaning. As usual, I started with the toughest task. It’s an old, unbreakable habit, instilled by my father from an early age. ‘Face up to the devil, and the rest is child’s play,’ he used to say. He would constantly ask me my worst fear and make me confront it immediately, whether it was a spider, a girl, a history essay or a bully at school. The old man wouldn’t let me rest for a second until the toughest thing in my life at that particular time had been accomplished. In cricket practice, he used to rip out two of the stumps, leaving only one to bowl at. ‘It’ll be easy when you come to matches,’ he’d say. ‘Having three to aim at will feel like child’s play. He was right, of course, and I would later thank him when I became, for a time, one of the most feared medium-pacers in the north London leagues. But somehow, no matter how many tough tasks I faced, there were always more awaiting me. The golden age where everything was finally child’s play always remained my father’s broken promise. After the bullies and the girls and the history essays came work, tax returns, marriage, a baby, a mortgage and a thousand other tough tasks. I threw myself at all of them, patiently waiting for everything to seem like child’s play, but the easy life always remained tantalizingly just around the corner. Finally I focused all my hopes on retirement, feeling sure that then I could finally ‘put my feet up’, as everyone said. But after a brief respite, I found myself once again paying bills, worrying about my pension, filling my life with tasks. And then Daisy got ill, and my arthritis got worse, and our only child died, and tough tasks seemed to take up the majority of my life once more. Now I am well aware that life will never seem like child’s play. But a habit is a habit, and so I still handle the toughest tasks first. Anybody who saw the inside of the clock, the elegant machinery of springs and weights, wheel trains and escapements all intersecting in perfect harmony, would understand why I could never let it be sullied by dirt from the outside world. When I am cleaning it, I slip into a trance. Time stops, my thoughts fly away, the world around me fades, and all that exists is the familiarity of the movements. My hands seem to act from memories of their own, without the need for conscious thought. I always remove the parts in the same order, squirt on the same cleaning fluid to remove solidified oil, use the same cloth to wipe the metal clean, and apply the same amount of fresh oil in the same places, before slipping everything firmly back together in the reverse order. There’s a neat circularity to it, progress of a kind. The metal gleams brighter than before, the parts have been checked and the possibility of a catastrophic failure averted. That’s about the only kind of progress I can believe in these days. Have you read Andrew Blackman’s ‘A Virtual Love’? What do you think about it? Great review, Vishy. I didn’t know you’ve read On the Holloway Road (or maybe you told me and I forgot). The grandfather is the most likeable character, isn’t he? I wonder if, in liking him so much, we actually mourn a long lost time before the age of internet. What do you make of the clock? It’s as much a part of the story as the characters. It was the first paragraph of the book that drew me in and I’ve always felt like that clock was something symbolic and much more meaningful than it appeared at first. Thanks Delia! I liked ‘On the Holloway Road’ too. I hope you get to read it sometime and like it. Yes, the grandfather is a really wonderful character. I agree with you that liking him means one mourns for the lost pre-internet era. I am sure we are just being nostalgic, but I also think things were much simpler then. I agree with you on the clock. It is definitely one of the characters in the story. I enjoyed the chapters and the passages where the clock makes an appearance. Ha, ha, ha! I think most of us will feel that, Linda 🙂 If you do get to read this book, I would love to hear your thoughts on it. I so glad you loved it – I did too. Andrew’s a huge talent, isn’t he? Thanks for stopping by, litlove. Andrew is definitely a huge talent. I can’t wait to find out what his next book is about. Glad to know that you too liked this book. I read it and I loved it. Like you, the grandfather was my favourite character. I think Andrew is gifted. Happy to see this post in my feedreader this morning (my program is slow so I’m late sometimes). I too liked the grandfather best, and the way the differences in age were highlighted. It seems we thought the same in regards to the ending – a nice wrap up would have been good, but the ending does fit the rest of the book. It brings focus to the rest of it because you’re unable to just close the book with everything finished neatly. Glad to know that you liked the review, Charlie. Nice to know that you liked the grandfather too. The ending was interesting, and it made me think. I liked what you said about the ending bringing focus to the rest of the book – that is very true. How strange, I didn’t receive a notification of this post. I must admit I skimmed your review as I was planning on reading the book soon myself. Unfortunately I’m always put off when so many read the same book. Of the ten bloggers I visit regularly 5 have reviewed it. That is surprising, Caroline. Maybe there was a problem in the mailing program of WordPress. Hope you get to read this book and like it. I will look forward to hearing your thoughts on it. Well, 5 reviews out of 10 is not bad, isn’t it? 🙂 I agree with you though – sometimes when everyone is reviewing or talking about a book, it is difficult to pick it up and read. I just need to let some time pass and the return to all the reviews and comment properly. I skim through the review now because I will be reading it. Glad to hear that you like it. Hope you get to read the book and like it, Jo. I will look forward to hearing your thoughts on it. I read this a couple of months ago (although have only just written out my thoughts on it), Vishy, and I enjoyed your take. I liked the Granddad a lot too, although I had some reservations about his point of view. I haven’t read ‘On the Holloway Road’ – would you recommend it to someone who was lukewarm on this one? Thanks for stopping by, Matthew. Glad to know that you read ‘A Virtual Love’ and liked it. Nice to know that you too liked the granddad character. I enjoyed reading ‘On the Holloway Road’. Some of the passages and chapters touched me very deeply. If you enjoy ‘road’ novels, you will like it. I would love to hear your thoughts, if you get to read it. That’s interesting Vishy, I’m not sure I’m a big fan of ‘road’ novels, so perhaps it’s not for me. If it ever crosses my path though, I’ll take a much closer look and see if it might be something I’d get through.